Set up a stereo pair or a multi-room system with this B&H Kit of one black and one white Sonos PLAY:1 Compact Wireless Speaker. They will connect to your home network via Ethernet or built-in Wi-Fi to stream music from thousands of free Internet Radio stations or from virtually any online music service including Pandora, Spotify, Rhapsody, and more. You can also stream music from your personal music libraries, such as iTunes, or from other network connected devices like your iPad or iPhone. 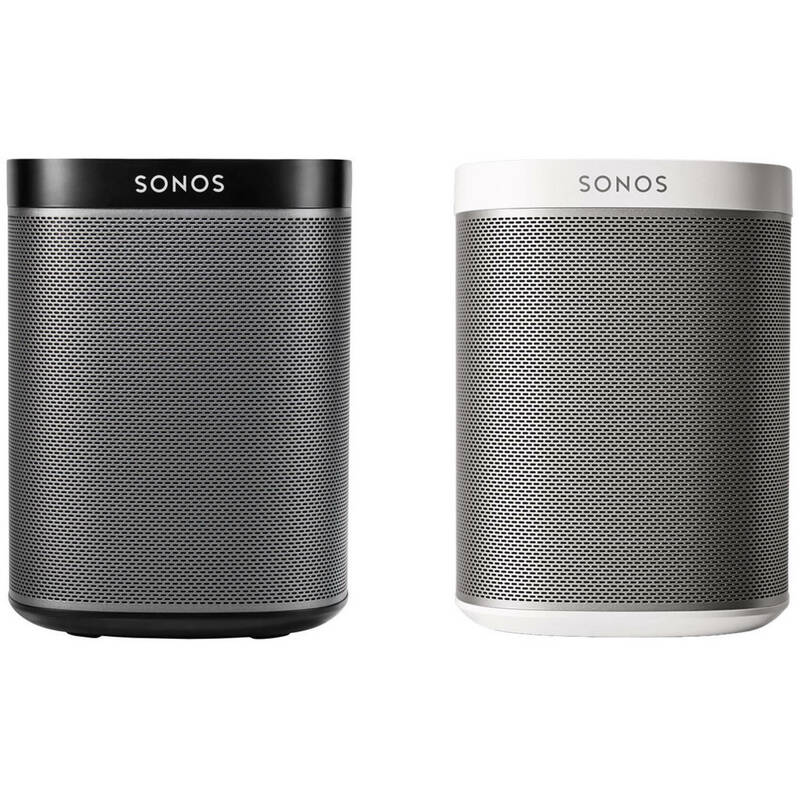 The white Sonos PLAY:1 Compact Wireless Speaker has a light metallic grille and lets you stream music from a variety of sources. It connects to your home network via Ethernet, or via built-in Wi-Fi. Once connected, you can stream music from iTunes or another personal music library. You can also stream music from thousands of free Internet Radio stations or from virtually any online music service including Pandora, Spotify, Rhapsody, and many more. You can also stream music from other network connected devices like your iPad or iPhone. Box Dimensions (LxWxH) 9.6 x 6.9 x 6.7"
PLAY:1 Compact Wireless Speaker Pair Kit (One Black, One White) is rated 4.0 out of 5 by 3. Rated 2 out of 5 by Matthew J from Doesn't fully support UPnP Pros: These speakers have a great interface with lots of services. The delay between clicking play and hearing sound is super minimal. There are capabilities to link multiple speakers together for left-right audio, and balance the sound between left and right speakers. Cons: My whole audio catalog is on my computer and it is broadcast via a Legacy UPnP as well as a DLNA server. Unfortunately Sonos doesn't support the superset DLNA standard (that pretty much everyone does). It also doesn't support UPnP fully. My server doesn't even show up as an option (after enabling UPnP Servers in Sonos). I use J River Media Center (mainly for their smartlist feature). Rated 5 out of 5 by Anonymous from Best multiroom system I've just added my 3rd and 4th Play1, plus I have the Sonos soundbar, and I couldn't be happier. They stream my Apple Music and Amazon prime music directly and were so easy to set up in a multi-room arrangement. They sound great, and look great too, for about the same price as a high-end bluetooth speaker you get much better sound and streaming options. Rated 5 out of 5 by Cory from Little speakers pack a punch Have two sets in each color, running one pair in stereo as background speakers and the set are running independently in our bathrooms. Sound is amazing and so is the user interface.